Hi there! Happy Saturday to you! I am actually spending the day today at a Stampin' Up! Regional event right here in San Antonio. I'm really looking forward to visiting with some wonderful friends and getting crafty. Yee Haw! I'm sure I will have lots of photos to share. Stay tuned for them. "Please choose at least two elements from the photo and describe how they inspired your card or project. Optional: since this is a baby shower dessert table, make something with a baby theme!" I paired the Domestic Goddess DSP with the Baby Bundle stamp set to create my card. That little bitty baby face is SO stinkin' cute, right? I dressed up the baby buggy with some Dazzling Details on the polka dots for a little pop. 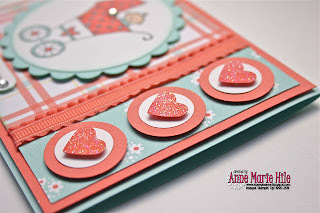 The hearts were created by rubbing a Versa-Mark pad over some Calypso Coral card stock and then embossed with Iridescent Ice Embossing powder. I punched them out with the small heart punch and then popped them up with some Stampin' Dimensionals. I'm actually pretty excited that I finally made a card that can be easily mailed, without extra postage. Haha! Thanks for visiting today! Please stop by Our Creative Corner to see what the rest of the Design Team has whipped up with Lori's fun challenge. We sure hope you can play along this week. OMgoodness! Too cute!!!!! I just worked on baby shower invites this week - that image would of been perfect!!! I adore those colors together!!!!! I would never have reached for Domestic Goddss dsp for a baby card but it is wonderful! You have created such a bright and festive card. You certainly met the challenge with your creation, Anne Marie. Love the colours, elements and layers that you chose. Awwww...a perfect baby card! The colors are so pretty! And, the adorable baby image is just too CUTE! Great card...love it! Take care and have a wonderful FUN weekend, hugs! Cute, cute, cute!! Those colors look great together. Love that inspiration photo AM. 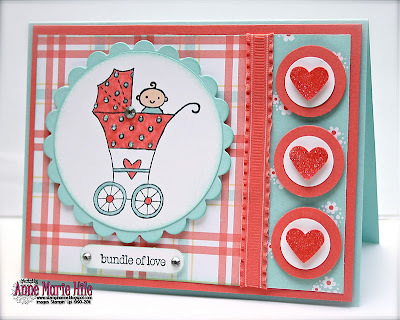 Great colours for the baby card, love the glitter on the hearts and the ruffled ribbon is super sweet! Hug Ann and Rita for me! Wish I could be there!! Have fun! Precious, precious, and even more precious!!! Love the image and the little hearts on the side are adorable. Too cute. Adorable ... so adorable! Great idea with your hearts. Need to write that down so I can remember ... lol. I know you are having a wonderful time with all your stampin' friends and I look forward to looking at your pics! Have a great weekend! 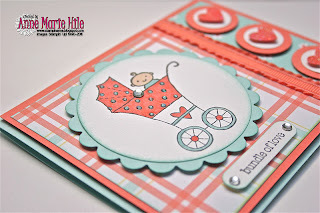 Beautiful baby card. Love the colors and the layout. The image is also cute. Great work ! Oh baby is right! Just delightful! I love this card. So beautiful! Gorgeous card! That set goes perfectly with the dsp! Thanks for joining us at Stamping 411!! What a great card, Anne Marie. I love the way you circled and popped up the hearts. Great touch! This is so adorable and I love the colors and paper you used! So creative!! LOL at the ability to mail it at regular post prices! You are too funny!! What a fabulously cute card! I just love the DSP you chose. And that cute image of the baby buggie. How perfect! Oh so stinkin cute! I'm just loving it! thank you for playing with stamping 411 this week. 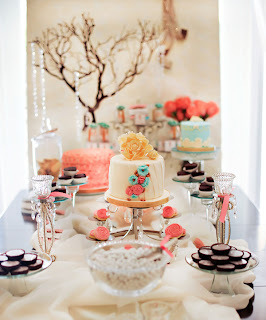 Oh My Gosh this is ADORABLE - I love the colors and the layout is spectacular. Fabulous as always! So totally sweet. The plaid is adorable with this. Thanks for sharing. This is too stinkin' cute!! 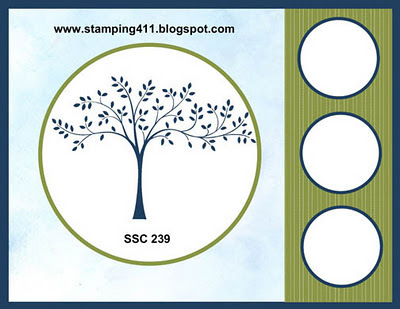 Thanks for playing along with us at Stamping 411!! We love seeing what everyone does with our sketches!! Your card is just adorable. The image is so sweet and I love the little hearts down the side. It was great to be a part of your team this week. Have a wonderful week! This is so adorable.....from the colors to the hearts! Love it!